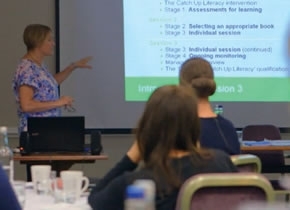 During the second half of the Autumn Term 2016, we were delighted to deliver more than 30 Catch Up® training courses, welcoming almost 500 attendees to the Catch Up Community! We delivered our core ‘Delivering Catch Up®’ sessions, plus our ‘Review and Refresh’ training sessions and some webinars too! Our accredited trainers were pleased to visit some of our Regional Training Centres, schools and other venues across the UK. Courses took place in South Lanarkshire, Essex, Liverpool, Manchester, Norfolk, Hampshire, Carmarthenshire, Durham, Belfast, County Kildare, South Wales, London, Cambridgeshire, Northamptonshire, Birmingham and Bristol! We have visited the length and breadth of the country! The trainers enjoyed getting to know attendees from primary, secondary and special needs settings. Working with staff from such a range of bases always leads to excellent discussions and the sharing of really good practice and ideas. It was particularly good to meet up again with familiar faces – staff from schools who have already successfully embedded one of the Catch Up® interventions, and who now wish to add the other intervention to their provision. Our Regional Training Centre based in the Durham area, hosted training once again this term. The trainer, Joyce Hughes, regularly delivers both Catch Up® Literacy and Catch Up® Numeracy training courses here. The courses take place at the Durham Leadership Centre in Spennymoor, where Joyce always receives a warm welcome. Joyce told us, “Often, the trainees are bowled over by the interventions, and leave feeling enthused and impassioned – I feel their learners are fortunate indeed.” You can read more about Joyce and her life as a Catch Up® Accredited Trainer in the ‘Meet the Trainer’ blog! Across all of our courses, the average trainee response to ‘How would you rate the training course overall?’ was 4.6 (with 1 being ‘poor’ and 5 being ‘excellent’)! What a great way to finish 2016! Thank you to all those who have attended our courses and are making a difference to struggling learners.